Do you ever wonder if it is possible to have higher confidence or have a steady level of confidence? But honestly you don’t want to ride the confidence roller-coaster. When you do, the small things can make your confidence elusive. A strong and stable level of confidence can boost your performance in soccer and help with other mental game challenges as well. Not only does confidence open the door to peak performance, it helps you battle nerves, cope with mistakes, and trust in your skills. Winters specializes in performance enhancement and has worked with many professional, elite and NCAA athletes. Winters’ philosophy is based on self-belief and the willingness to work, train and prepare for what you want. 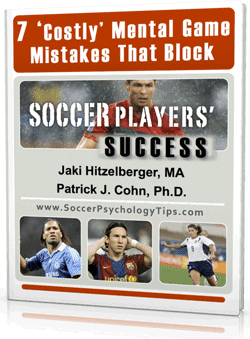 Winters understands that confidence is not the sole factor responsible for peak performance. Winters emphasizes that athletes must put in the work to succeed. You can have confidence without the preparation and hard work. I summarized Winters’ notions regarding confidence and preparation. 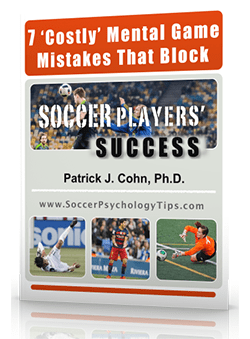 Tip #1: Excellence in soccer comes from the will to prepare and train coupled with high, stable confidence. And having stable confidence comes from belief in your abilities, not just from training. Tip #2: Commit to the plan, work the plan and go the extra mile when training for games. Focused preparation will dramatically improve your athletic confidence. 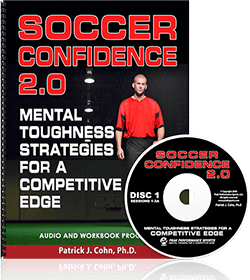 Boost your confidence in soccer today with our Soccer Confidence Workbook and CD Program! it is great to read about this confidence article, but, too many coaches do not know how to instill it in a player…..even tho, the player may be of the highest level…..how do they learn to do it?